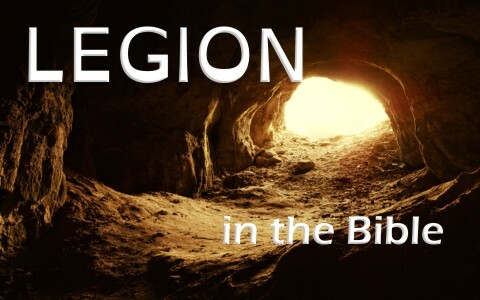 Who Was Legion In The Bible? When a “legion” is mentioned in the Bible, what was it? Jesus encountered a man named Legion in the Bible, who was he? When we find the word “legion” in the New Testament, it’s referring to a specific number more than a Roman legion itself. A Roman legion was a division of the Roman army and typically numbered between 3,000 and 6,000 soldiers, so a legion is a considerable force. Add to that, these Roman soldiers were battle-tested, highly trained and skilled warriors who were the greatest force on earth (at the time). Today, we might use the word “legion” to describe a large number of things, like “There is a legion of mosquitoes outside,” so when we read the word legion, it has a completely different meaning than in the day in which Jesus had His earthly ministry. When Jesus cast out demons, they always know who He was. Probably because they had known Him before Lucifer’s rebellion in heaven where Satan and 1/3rd of the angels followed him but were all cast out of heaven. In one case, Jesus faced a demon possessed man in the synagogue and as Mark writes, “in their synagogue a man with an unclean spirit. And he cried out he said to him, ‘What have you to do with us, Jesus of Nazareth? Have you come to destroy us? I know who you are—the Holy One of God’” (Mark 1:23-24)? Jesus didn’t like this profession because it was not yet time for His deity to be revealed, so “Jesus rebuked him, saying, ‘Be silent, and come out of him!’ And the unclean spirit, convulsing him and crying out with a loud voice, came out of him” (Mark 1:25-26). Jesus never failed at casting out demons because He was God and as God, all authority is His. There was no chance of His failing, but others who would later try to cast out demons would fail, like the Seven Sons of Sceva (Acts 19:14-16). When these itinerant Jewish men tried to cast out a demon, the evil spirit came out but jumped on them and “gave them such a beating that they ran out of the house naked and bleeding” (Acts 19:16), so you don’t want to mess with demons unless you really know what you’re doing. Night and day among the tombs and in the hills he would cry out and cut himself with stones. In one of the most extraordinary demon encounters in the Bible, Jesus doesn’t just face one demon, but thousands. When Jesus and the other disciples “got out of the boat, a man with an impure spirit came from the tombs to meet him. This man lived in the tombs, and no one could bind him anymore, not even with a chain” (Mark 5:2-3). Apparently this demon possessed man had to be chained because “he had often been chained hand and foot, but he tore the chains apart and broke the irons on his feet. No one was strong enough to subdue him. Night and day among the tombs and in the hills he would cry out and cut himself with stones” (Mark 5:4-5). This was no ordinary demon possessed man, because “Jesus asked him, ‘What is your name?’, ‘My name is Legion,’ he replied, ‘for we are many.’ And he begged Jesus again and again not to send them out of the area” (Mark 5:9-10). Why would this legion of demons beg Jesus to not “send them out of the area?” It’s because demons passionately desire to possess a living being. They are not at rest until they can find a place to call home, and apparently this man has thousands of demons in him. We know because the word “legion” is a number that could be anywhere between three and six thousand. Imagine the strength that this man must have had! What a terror he must have proved to the local residents. What man in his own strength can break chains so easily unless he is empowered from an evil force…or, as in Samson’s case, it was God Who gave Samson his great strength. The question isn’t so much “Who was Legion in the Bible,” but how many were in the Legion who possessed the man? It’s not so much of a name, as it is a number or force, and it was a potent force. Imagine what thousands of angels could do. It only took one angel to kill thousands in ancient Israel’s experience with pagan armies. One angel would be a majority for any army, so what power there must have been in up to 6,000 demons? I have noticed that the demons Jesus’ met was a proper noun. It was a capitalized Legion, so these cohorts must have been unified for one purpose. Part of that purpose was probably to terrorize the local residents, but ultimately, it was to give God the glory, as we shall see in Jesus’ sovereignty, even over the demons. Then the demons “begged Jesus, ‘Send us among the pigs; allow us to go into them.’ He gave them permission, and the impure spirits came out and went into the pigs. The herd, about two thousand in number, rushed down the steep bank into the lake and were drowned” (Mark 5:12-13). This clearly shows that even the demons are God’s demons. They have to ask Jesus’ permission to do anything, so, in desperation, they ask Jesus’ permission to enter the pigs. You have to wonder if the demons thought about entering into Jesus’ disciples, or those who were nearby tending the pigs. If they had, they knew they’d have to get Jesus’ permission first, and they probably realized that Jesus would’ve never given His permission for that. Maybe that’s why they didn’t ask, and instead they sought entry into the pigs. They thought it was better than being in a state of spiritual emptiness. Also, the pigs are representative of something unclean, because they were considered not only unclean as food, but also the Jews listed them as an unclean animal. The lesson in this account is that we know there are demons, and if there are demons, they seek to afflict and persecute believers. Demons may look for non-believers in seeking a place to abide, and they’ll very likely look for those who are into the occult, into heavy drug abuse, or by trying to empty their minds in mediation. These satanic practices open the door for demon possession, because the danger of an open mind is just about anything can come in. Perhaps Legion was the spokesperson for a force of demons that had an express purpose. Maybe their mission was to terrorize, but as we know, God can use evil for good (Gen 50:20), and these demons professed that Jesus Christ has authority over them because they acknowledged that Jesus is “Son of the Most High God” (Mark 5:7) and they had to seek His permission to do anything. That’s because He has authority over the demons, and over all the creation. This includes all His creatures, including you and me. If we submit voluntarily, by coming to Him in faith, and placing our trust in Christ, we will want to submit to Him; but for those who all their lives have rejected Jesus Christ, God says to them, “’As surely as I live,’ says the Lord, ‘every knee will bow before me; every tongue will acknowledge God’” (Rom 14:11). Every knee will bow….the question is, will we do it willingly, in humility, or will we be forced to do it, because one way or another, every knee will bow! There is no doubt about that. Indeed there are demons and possessed people today…not just in Bible times. I have experienced them in my face, personally. There is also a literal burning lake of fire into which all demons and humans will be cast who do not accept God’s lifeline of Jesus. It is so imperative that we preach this disaster of the lake of fire which awaits all of those who are without Christ. Where is the church today? Amen. I had a cousin in jail who faced one and he was terrified by this man who was possessed. Amen about this wrath of God needing to be preached because only when the wrath of God is preached does God’s mercy seem so relevant. Amen…where is the gospel of repentance and faith at that Jesus brought (Mark 1:15)? Thanks brother. Previous post: What Does It Mean to be Not Of This World As a Christian?